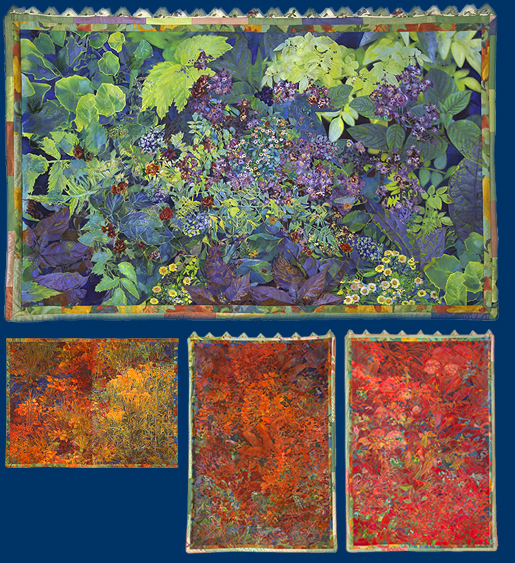 Linda Freeman’s imaginary views of the forest and plants at various times of the day is richly colored. Each image exudes a different mood and emotional tenor. 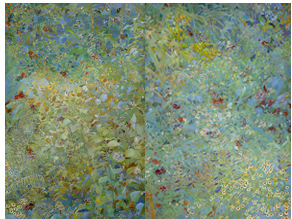 Freeman paints in high drama with surging form, the plants serving as a symbol of life and the passage of time. The resulting paintings do not depict actual events. Rather they represent the powerful emotional residue of her life experience. Despite their fresh improvisational appearance, Freeman’s work has developed painstakingly over many years. 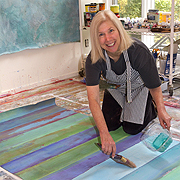 The techniques that mark her painting style include layers of acrylic overlaid with oil glazes, which allow for a delicate transparent effect. Freeman’s paintings are bordered with multi colored fabrics complementing the ethereal transparencies of the finished work. HOURS: TUES. - SAT. , 12 - 6 P.M.